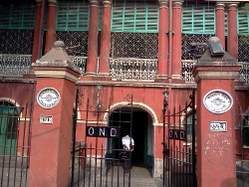 West Bengal tourism department has started a tour of Kolkata called SUTANUTI TRAIL which covers heritage buildings in north Kolkata. 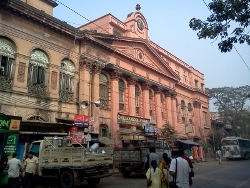 Sutanuti was one of the three villages which were merged to form the city of Kolkata. Details of the tour from tourism website is given below. This should be an interesting tour and I'm planning to do this in near future. Did you go on this trip? I was also planning to go on it. :) Would love to hear your experience. No yet. Good that you asked. Planning to go this Sunday. However there is a caveat - tour may cancelled if there is less than 14 participants. I booked for 4-Dec, but it got postponed to 10-Dec now. I took the Sutanuti Trail trip on 10-Dec and what a trip it turned out to be. This should be a must do pilgrimage for anybody interested in Kolkata. I will give sneak preview of the trip - rest is for you to experience. The tour starts at 7:30 am from tourism office in BBD Bag, bang opposite Dalhousie bus terminus. When I reached there at around 6:50 am office was already open since few other trips also start from there. There were around 10 of us including a team from bengali tv channel doing a episode on the trail. The journey through Sutanuti (north Kolkata) comes alive when you hear from noted conservationist Probal Deb, himself member of Shovabazar rajbari. 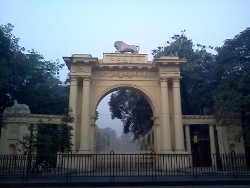 He is extremely knowledgeable, and leads you through past and present Kolkata as the tour progresses. The journey would have been half as interesting if it was not for Mr. Deb. The journey started with Mr. Deb giving telling many lesser known facts around time Kolkata was established 300 yrs back as our bus crossed Rajbhavan (governer's house), GPO, Writers building and turned towards Chitpur Road (Rabindra Sarani). 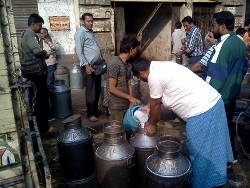 Sutanuti is present day in north Kolkata where most of the Indian crowd used to stay in early days. It was called the black town as against the white town in central Kolkata where the sahib's used to stay. 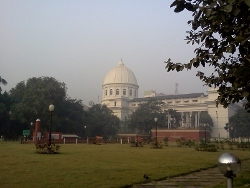 Before the ugly piece of concrete called telephone bhavan came up, one could see Writer's Building (seat of revenue) from Rajbhavan (seat of power). Before the battle of Plassey in 1757 there was a battle in 1756 in Kolkata when Siraj-ud-daulah attacked the old fort william where present day GPO stands, about which soldier Holwell reported back to England. 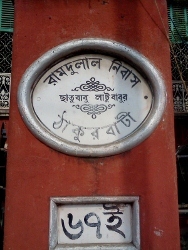 Chitpur Road (present name Rabindra Sarani) is the oldest surviving road in Kolkata was also called Pilgrimage Road by sahibs. 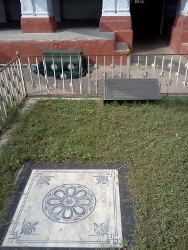 Our first stop was at Jorasanko Rajbari just after crossing on Chitpur road and Vivekananda road. 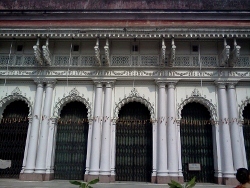 Jorasanko Rajbari is different from Jorasanko Thakurbari which is associated with Kabiguru Rabindra Nath Thakur. This building was established in 1760 and has a big inside courtyard surrounded by rooms. The building is still inhibited by members of noble family many of whom are doctors and lawyers now. 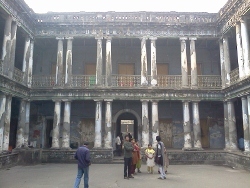 The building looks dilapidated although its not crumbling. 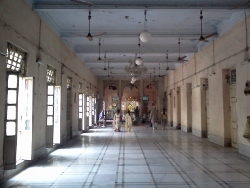 Mr Deb said that efforts are on to restore the building to original glory. 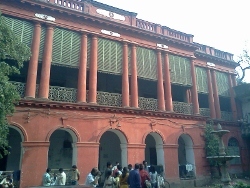 On left of Jorasanko Rajbari is the present day Lohia Matri Sevasadan (Hospital) which was originally built by Babu Haren Sil but had to sell off in their pursuit of music and art. 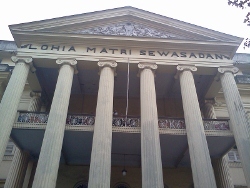 The building has gigantic pillars on the front and gives a majestic feel. Opposite to Lohia is what is called Ghariwali Building because of its big clock on the top which still shows correct time. I could not resist temptation to capture few moments of morning activities on Chitpur Road for benefit of those missing Kolkata from a distance. Leaving Jorsanko we took Strand Bank Road crossing Nimtolla Ghat, Kumartuli ghat, Bagbazar Ghat etc. We passed by rows of old warehouses that line the Ganges. We took a tea break at Kumartuli ghat and enjoyed the river scene while listening to interesting stories from fellow travelers. 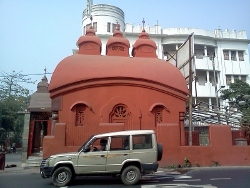 From Strand Bank Road to Kumartuli was a small hop in the bus. 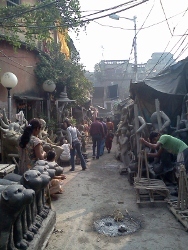 The typical busy scenes of Kumartuli before Durga Puja were missing. 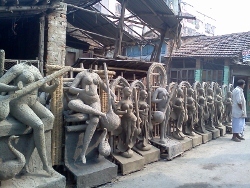 We found few artists working on Saraswati idols. 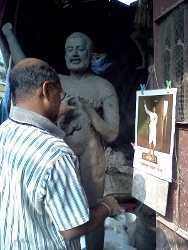 One artist was making a statue of Ramkrishna Paramhansa by looking at a old calender picture. We visited the Dhakeswari Temple in Kumartuli, whose diety was brought from Dhaka during partition. 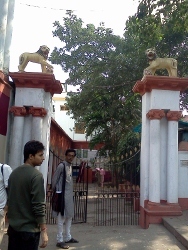 Nex attraction was palace of Gokul Mitra on Chitpur Road which has the largest Nat Mandir in Asia. Nat Mandir is the space in front deity used from musical events to please God. 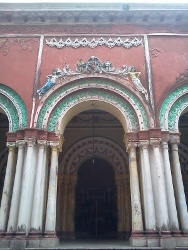 The temple inside building contains the original Madan Mohan idol from Bishnupur temple of same name. Mr. Deb narrated the interesting story of how the idol ended up with this family. The building is painted red even from inside and has beautiful architecture. 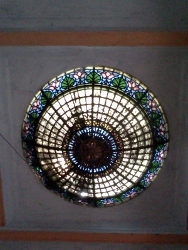 In the staircase I found a beautiful sun roof with stained glass. 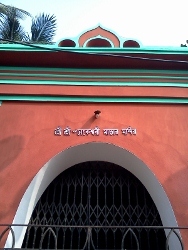 Next to Gokul Mitra bari is the house of KC Das family of KC Das mishti fame. Leaving Chitpur Road we came to Central Avenue and crossed famous landmarks like remains of Girish Ghosh building (which has to be brought down when central avenue was made), house of Sister Nivedita (attempts are made to renovate the house by goverment) and Pute Kalimandir. Oh not to mention we picked up sumptuous breakfast packets of Dwarik Ghosh containing luchi aloordam, mishti doi and two more sweets. 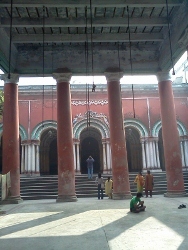 The diety of Pute Kalibari was found by a member of Shovabazar rajbari while taking a bath in a pond, but since their familiy were worshippers of Lord Radhakrishna and these two cannot exist in same temple, they created the Pute Kalimandir just outside their palace. Pute is small and temple is so called because of its size. 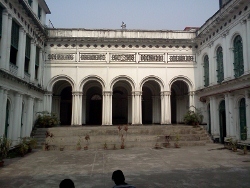 Just after Pute Kalibari we took left and stopped at the series of palaces belonging to the noble family of Shovabazar . 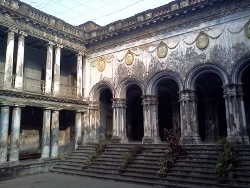 There are multiple buildings on both sided of Naba Krisha Deb lane occupied by various members of the family. Mr Probal Deb accompanying us for the tour is from this royal family. 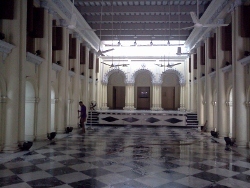 We first visited the Natmandir looking splendid after renovation. 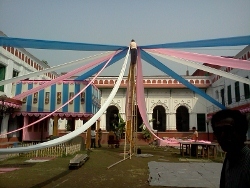 This was possible was much effort by Mr. Deb and others. 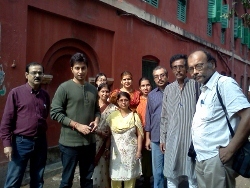 Thereafter we visited the Rajbari and Chhoto rajar bari. Some of the buildings are rented out for various programs thus providing vital revenue for restoration and upkeep of the buildings. We found the are within palace complex where Swami Vivekanda was felicitated by citizens of Kolkata when he returned after attending Parliament of Religions in Chicago. Mr Deb narrated few interested anecdotes of their family and how their lives transformed over the ages. It took Mr Deb long years to convince other family members for the need of preserving their heritage. On our way from to Chhatu Babu Latu Babu building, Mr Deb explained how these names became associated with the noble family. The present generation of this noble family first came up with the idea of renting out their courtyards for various programs in order to raise money for maintenance of the buildings which was subsequently taken up by other families. 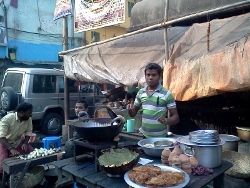 Opposite to the royal house is the local market named after Chhatu Babu. Some of fellow travellers were departing from that point and we took group pictures in front of the house. The next attraction is one of the most famous and well preserved heritage buildings of Kolkata - the Marble Palace on Muktaram Babu Street. Interestingly this building was constructed not for residential purpose but as a gallery and museum. The Marble Palace complex is on a vast area containing finely manicured lawns, water bodies, temple and residential buildings. Marble palace contains fine collection of paintings, pottery, sculptures in many royal rooms surrounding a central courtyard. There are ballrooms, painting rooms, meeting rooms etc inside the building. The ballroom has floor to ceiling mirrors with finely engraved wooden frames and we were wondering how these mirrors were brought inside the rooms. The sculpture room contained a gigantic figure of Queen Victoria which almost reached upto the ceiling. I felt the statue should be kept in a bigger room to appreciate its beauty. The building is also a mini zoo and contains various exotic birds in big cages on the balcony. Long back there used to a big python. 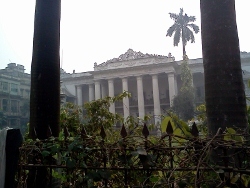 Our last stop was Jorasanko Thakurbari - house of Nobel laureate Rabindra Nath Thakur. 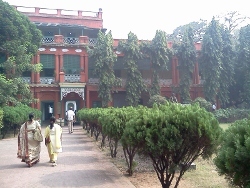 The building has been turned into a museum on Tagore and various articles are on display. Entry fee for the galleries in Rs. 10/-. You can visit the room where Rabindra Nath used stay and where he breathed his last, collection of his writings and drawings and various family photographs. 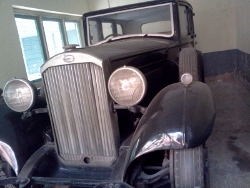 The vintage car used by Tagore family is also preserved in a garage. To cover all the rooms of this building in details you need at least half a day. 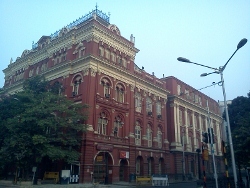 Thus came the end of our wonderful journey of Kolkata's past. My sincere thanks to West Bengal tourism and . Probal Deb for making this happen.